About nine months ago we finished up most of the dirty work on the kids rooms. Installing windows, dry rot repair, and painting the rooms, trim, doors and molding. But one surprisingly big standout was spray painting the doorknobs. I was fairly worried that they wouldn't hold up well with just spray paint, but low and behold, they're doing great!I decided it was about time I try to make our upstairs bathroom significantly nicer. After seeing the huge improvement updating our home locks, and substantial improvement with the kid's knobs and hinges, I decided to give it another go. I really thought I had before pictures of the door, but I can't find them. If I run across them someday, I'll throw them up here. The inside know was nickle and the outside of it was rusted gold. The hinges were gold at some point, I'm sure, but by the time we got them they were mostly rust colored. There was a fair amount of paint on all of them. Nothing super unique to the process. I scraped off any paint drips on the hinges with a razor blade. I sanded all the gunk I could off of them, and even on the nicer sides I roughed them up with a high grit sandpaper. It took a little while, but gave the paint lots of texture for the paint to stick to, and a super nice finish when done. Then, I jammed them in the same cardboard boxes I used last time. I use really super light sprays. I don't want to make any of the mechanical parts sticky, so slow and steady was the way to go. Probably about 10-15 sprayings in all. To change gears, I took the time the door was off the hinges to shorten it up a bit. There was very little gap between the tile and the bottom of the door, and recently, the door had started catching on the tile as it swung. Tightening the screws brought it up a hair, but it was still too close for me to be comfortable with it. I could see the door was already starting to spread apart just from a few days of real sticking. I didn't want it to get worse. After a day and a half of a missing a bathroom door, we got what we were going for. 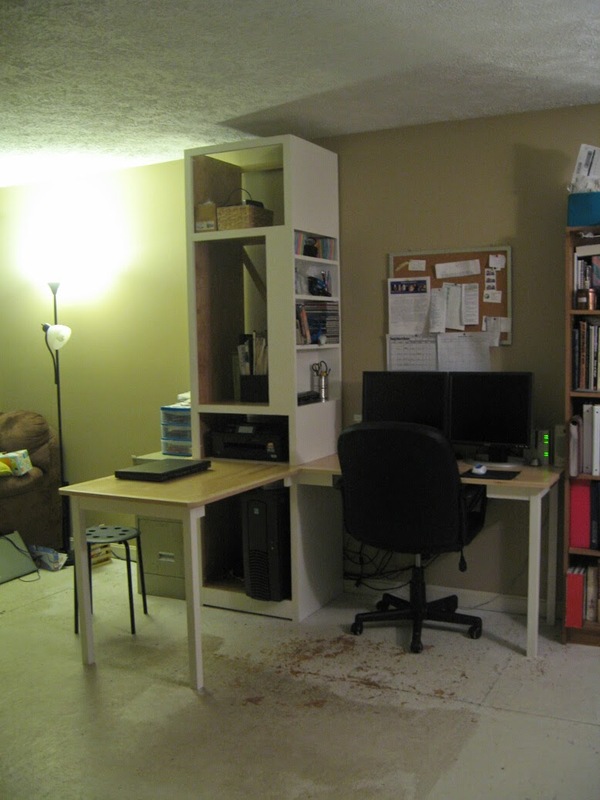 It's nothing spectacular to see in these picture, but it's huge to updating the polish of a room. Even my husband was complimenting the upgrade for days after. I still have to paint the doors and trim in the bathroom, but we'll get there someday. It's these little things that add up to make a room look a little bit nicer. I'm doing a terrible job at taking good pictures of this project, but when I get each section finished useable, I can't help but share right away. When I get the drawers and shelves in, I'll take nicer one. So, that last piece of the office stand puzzle is in. 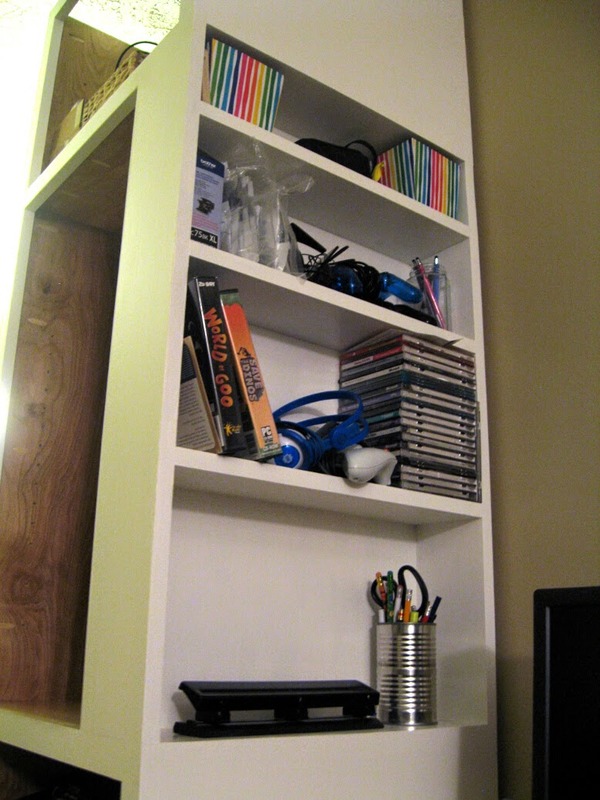 I did have this 3rd part showing in this post, but it wasn't painted and the bookshelf side wasn't done. But here it is, as I was envisioning it. 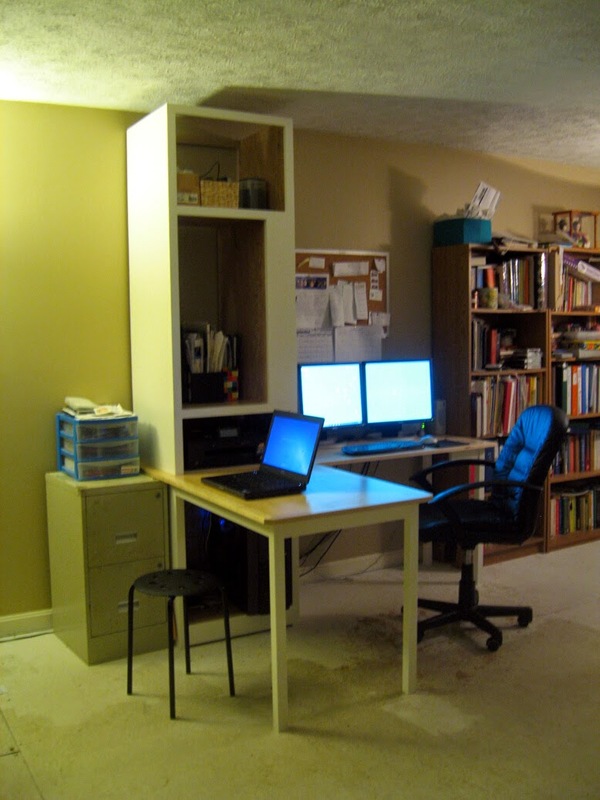 As I've said before, I wanted to have one side devoted to a desktop and its monitors. The other side I was hoping to serve as a mostly open place to put our papers to sort and to use as a desk space. If we buy a laptop again, it would likely be hanging out up top there too. It'll work great for a nice workspace when I work from home too. I'm also hoping it will stay clear enough that we can use it for homework and board games. We'll see how that goes. Here's a closeup of the tower. We still have a lot to do to make it look nice. 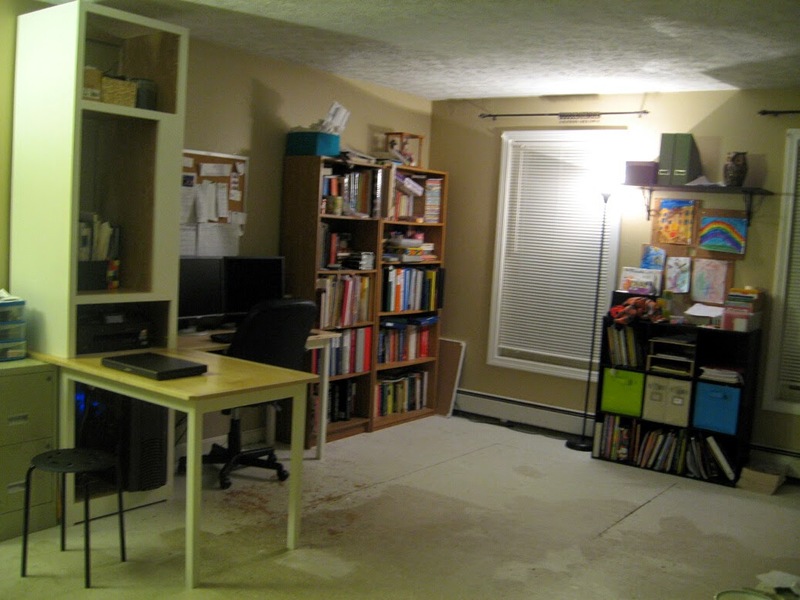 Now that it's out of basement light, there's a few places I'll want to repaint. 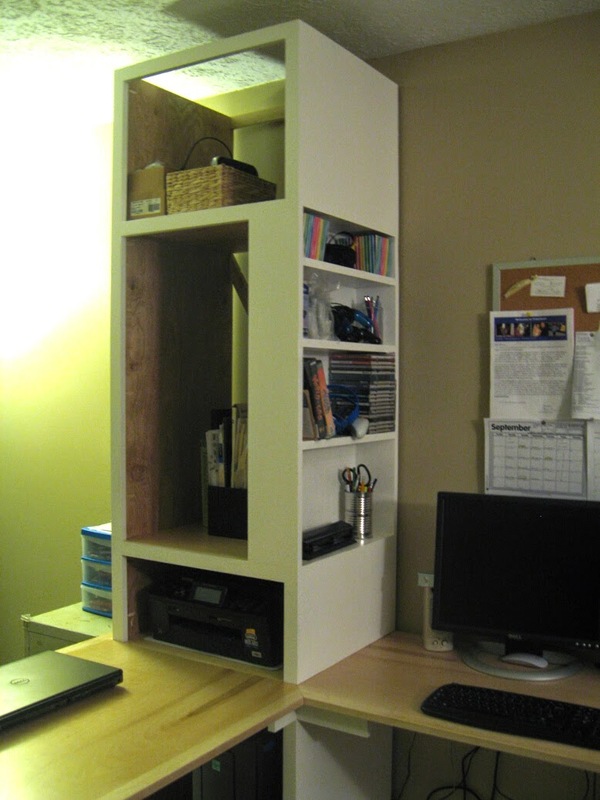 Plus I need to make a drawer for the printer, and buy some cabinent door faces. I'm not convinced I want one for the middle comparement, but the others are going to have them. I'll need to make shelves soon too. 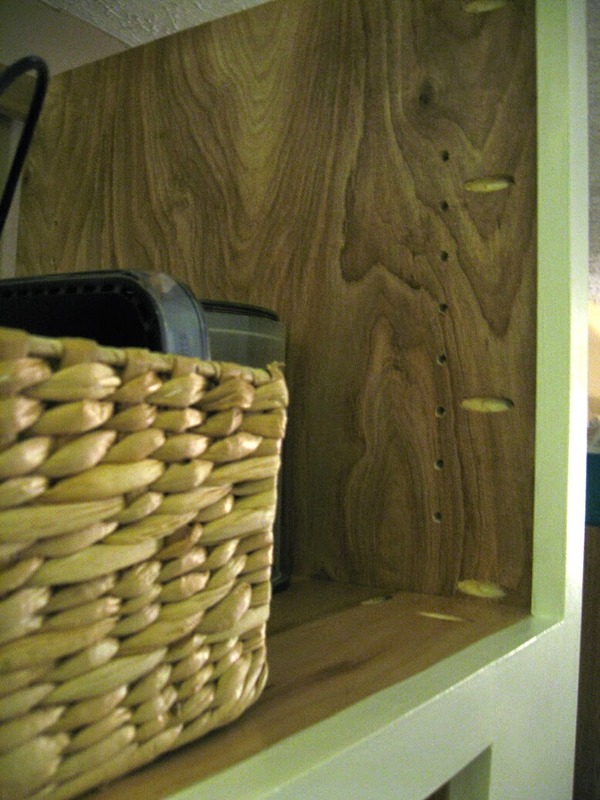 Speaking of shelves, I was able to use the shelf pin jig (made by Kreig) to put the holes in. Worked wonderfully. I'm so glad I got it as a birthday present from my wonderful husband. I'd hate to finish the hole project just to ruin it with a bad pin hole. While I expect the other shelves are going to be put on the backburner for a little bit because of other house repair priorities (windows again?? ), at least we'll have these shelves to console ourseves with. As of right now, they're ugly. They're holding too much of what the drawers/pulls/shelves/etc. are supposed to, but those aren't done yet. I still find this as great progress. Our camera bag actually has a place to sit! We still have a ton to do before I call this project, let alone this space, finished. But we're at about 70% functional, and I am loving it! ...unless of course, you're eating your 1st birthday cake. Portal is such a good game. Portal II is also a good game. One of my favorites. If you haven't played, you won't understand this post at all. I however, have played Portal I. And thanks to my odd sense of humor, find a bib with the quote on it really, really funny. Especially when the baby wearing it is around cake, eating it or not. And knowing that the combination of playing the game, finding the quote on a baby bib funny and actually having procreated is a rare one - I jumped at an opportunity. An avid gamer friend's baby turned one this last week, and I had to get my sew on. Their bib looks a lot better than ours... not just because it's new, but I did do a better job with it. I'm really happy with the way it turned out. Kinda rare for a perfectionist like myself. You find it at least a little funny... right? Singapore Math Manipulatives App - Tangible Math! Being All Thrifty! EDIT: Available now! Purchase on iPad, Kindle Fire, Nook, or any other Android device. And you can find out more about the app here. I'm going to divert from writing about all the house/wood working I've been doing lately. One project that has been filling my 'downtime' is a new app that my husband and I are working on together. It was something I had looked for our Kindle when I started using Singapore Math for Eve in 1st grade (about two years ago). Wow, time flies. Eve's now in 3rd Grade, Eli in 1st, and Isaac is in preschool. I can't resist putting the occasional pictures of these cuties on here. These are from the end of the last school year. We've tweaked our homeschooling a little bit since that post I referenced above. (If you're just joining in, I work full time out of the home, and teach math and art after work. My husband Jon works [very] part-time at home, and teaches the other subjects, although we cross into eachother's subjects all the time). French: Powerglide French didn't even last a month, so that was out. We've been slowly increasing our french children's books with some good ones. The Duolingo app has helped Eve come along well, and recently we bought Rosetta Stone French 1 & 2 used, so we'll be trying that out soon. I have an app idea for teaching French too... we'll see how this app does before I try to make another one. But it could be awesome! Language: For Eve, A Beka was replaced by Bob Jones for 2nd Grade, and for 3rd grade we've replaced Bob Jones with... nothing. Long story short, after looking at them year by year, it seems the curriculum barely changes. So we'll skip the seatwork this year, and formally teach grammar once at an older age. It's not worth the battle. We'll be focusing on spelling this year instead, which seems more important to us at this age. Eli used McRuffy for Kindergarten, and he'll use him again for 1st Grade. Besides all the gluing required, the program worked well for teaching Eli to read. Science: Still a mix taken from from books on hand. 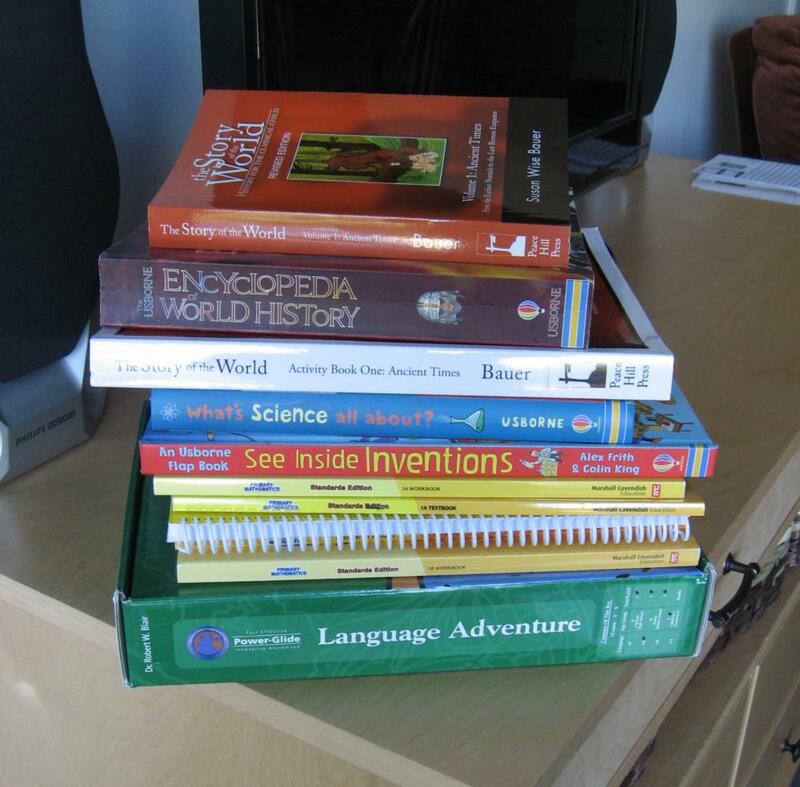 The intro to biology and chemistry were covered in 1st grade and beginning 2nd. Now with an Apologia book and a middle school science textbook in the mix we're getting into some ::awesome:: physics and engineering concepts. History: Story of the World is still a big hit with my husband and our kids, so they've been taking their time and going through that. They're somewhere in the second book now. Math: Singapore Math is still my favorite. I've checked out a few other math curriculum at friends houses and curriculum fairs, but I still love Singapore Math the most of all I've seen. I love that the program teaches 'number sense', which gives the child tools to understand how math works in real life, rather than always teaching to writing numbers down on paper (which of course, is taught as well). I love that I haven't run into any 'rules' that we teach one year and obsolete the next. I love that the program repeats concepts, but with increasing difficulty. So problems are challenging and familiar. For example, the skills learned when adding numbers 1-10 are some of the same skills used to add numbers up to a hundred. Finally, I love that the program is manipulative based, but I didn't know that at first... which brings me back to the point of the post. Man, I'm long winded. Back when Eve was in 1st grade, I learned really quickly that I was teaching her math out of order. I would go to the text book right away, skip any hands on activities and then give her the workbook to do. That method was nothing but tears. She hated it. She hated math. Heartbroken that I was squashing Eve's love of math, I changed it up. I thought about how she liked to learn, starting slow, lots of examples and encouraging words to give her confidence to solve the problem before she's asked to solve. Then I went to the home instructor guide. You know, the one I was ignoring. Yeah, the curriculum is set up to teach with manipulatives first, and then head to text once the concept are already learned. Whoops. 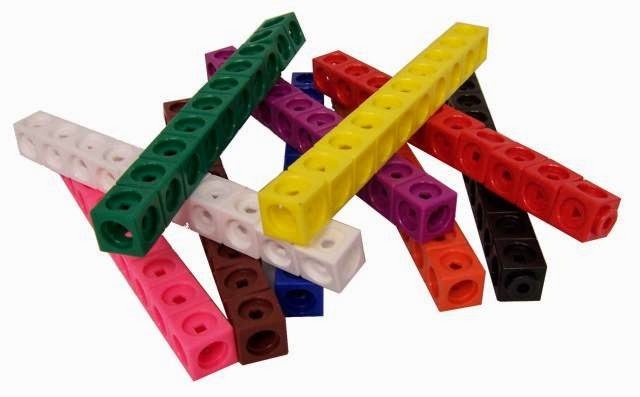 Adding manipulatives was the first big hurtle to overcome teaching Eve math. As a sidenote - There were also two other things that has really helped us. The first was to use two chalkboards (one for each of us) instead of a dry erase. The slow writing really seemed to help focus on the problem. The second works well for us, as I work during the day. I would teach at night and then circle the pages to be done the next day while I was at work. I allowed for the concept to have some time to sink in, and gave Eve more confidence. Oy, the point of the post. I'm losing it again. I grew to love using manipulatives... but hadn't actually bought every single one Singapore Math had listed. And they listed a lot. Adding up everything they suggested just for first grade is well over $75. 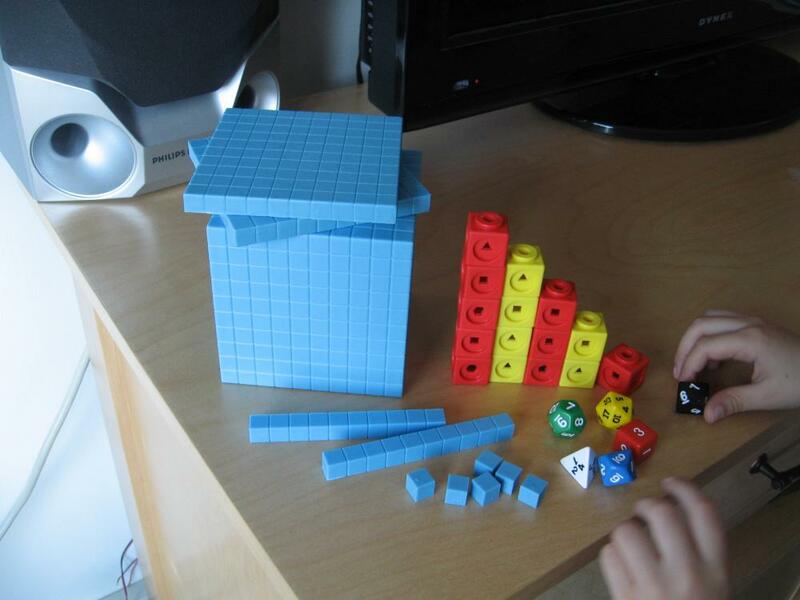 We did buy these mathlink cubes (Love them! Buy them!) and base 10 cubes. They're still not exactly cheap, but you can get them at rainbows resources for about $25 total. We've found them well worth the money. I recommend them in every homeschooling family's house. Even public schoolers would do well to have them. For the other manipulatives, we did what we could. We made up some ourselves (base 10 cards, number cards, place value strips), scanned some that came in the back of the book (hundreds charts), grabbed what I could from around the house (clocks, scales) and skipped others altogether (counting bears, place value disks). I really didn't mind using a handmade balance or just grabbing a clock off the wall... but there were times I really wished I had some of the extras. And then there were other times I had handmade something, like place value cards, and still didn't use them much. I didn't want to go digging around for them and then take more time setting them up. Often we teach math on a bed or on the couch, so setting cards up so they don't fall over isn't easy. Sometimes with a toddler around, it's impossible. So of course, I thought, "This would be so awesome to have in app form." I couldn't find anything like this for Android or even the iPad. Kinda surprised, I started thinking about how I would do it. And then planning it out. And then sketching it up. And then that all halted when I came to asking Jon about making it. We were in the middle of making another app (Boardgame Apprentice) so our time was limited and my idea was put on the backburner. Skip a year and a half ahead, and after lots of begging I got my husband to whip something together for me. (I convinced him by saying it was an instant 'sale' of $25. If he didn't make the app, I was going to break down buy $25 of the extra manipulatives I didn't have). The first version was crude, of course, but it showed me it could be just what I wanted. So, after a lot of development time we're almost to the point of releasing the app. Jon (my hubby) does the programming and I do the art. I've mentioned it before, but my preferred weapon of art is inkscape, an open source (ie, free) software. Yes, Jon can actually spell. He's all too good at scrabble. We're going to be releasing it on both Android and Apple. It'll be our first Apple App, and we're planning on releasing our other two apps (Gladiator and Board Game Apprentice) for Apple at the same time. We needed to have a mac to develop for Apple, which we've put off for a bit, but got one a few months ago. That's why we've had the Mac Mini sitting around in some of my other recent posts. So, this is what we have so far. I know, I know, you love it already. But don't get too attached as there will be several more changes to both design and art. The basic premise is this - There's a bunch of backgrounds to choose from and a bunch of objects you can place on the background. There's also a drawing tool, so you can use the whole screen as a whiteboard. The app isn't intended to do any teaching for you. It won't make up problems, or grade your child if they're correct. It's a tool to be used by an instructor (for for a child to use to work out homework problems). Plus, the open-nes gives the app the flexibility to be used with other curriculum (or no curriculum at all - great for preschool!). I made it for my personal use with Singapore Math, but I also added anything big I saw used in Horizon's 1st grade curriculum too. Several backgrounds have snapping points so that numbers or objects snap in a natural way. So there you have it. We're hoping to have a tutorial in the app before its first release, we'll see how that goes time-wise. We'd also love to have demo boards, or a guide of some sort to help give ideas of how the different boards available could be used, but that will have to wait until a future release. 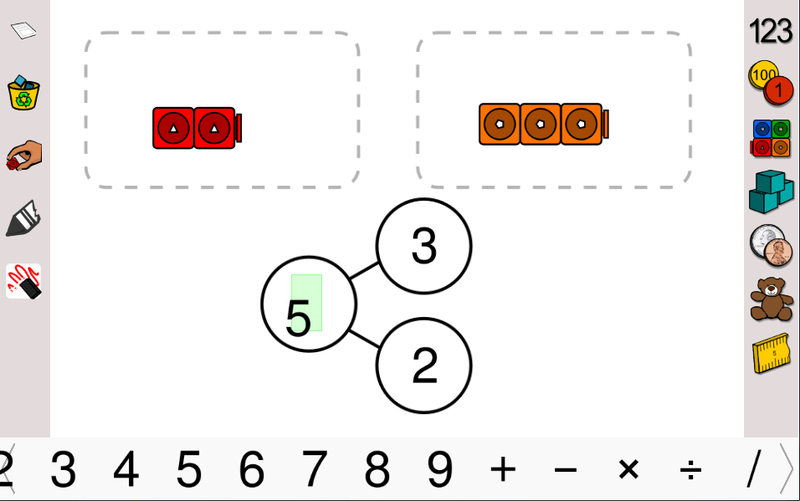 Likewise, it would be cool to have an explanation of the different 'new' concepts, like number bonds. I could see this exceptionally helpful for parents of public school children who miss out on what the teacher is teaching in the lessons, but still need to help with homework. We're hoping to have this out October 2014-ish. A free trial version might be released, but we still need figure out the details for that. It's a such strange phenomenon that no one wants to pay for apps. I won't rant about it again. Beyond that, I'll want a 2nd/3rd grade version next. I've got more math to teach to these big kids!